This fabric canvas art uses fun, patterned fabric for the background. Just add a painted wood cut out to the front for instant wall decor. Hey there! As you may or may not know, I've been working on doing some fabric canvas art for my place – inexpensive but cute. I dug through my fabric scraps the other day and found some Denyse Schmidt County Fair fabric. It turned out there was just enough to cover a 12″ x 16″ canvas, so the wheels started turning. I then looked through my surface bin, and found a wood bird cutout. Don't remember when or where I got this particular one, but I've seen similar at several craft stores, especially in the seasonal section. Anyhoo, I completed this Mod Podge canvas project in less than an afternoon. It's SO easy even a beginning crafter can do it. 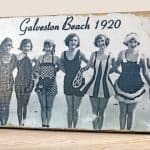 Here's how I made this DIY canvas art. You will first want to prepare the fabric before painting. To do this, wash and dry the fabric (do not use fabric softener). Iron and then lay out on a covered work surface. Wax paper is preferable for covering your table. 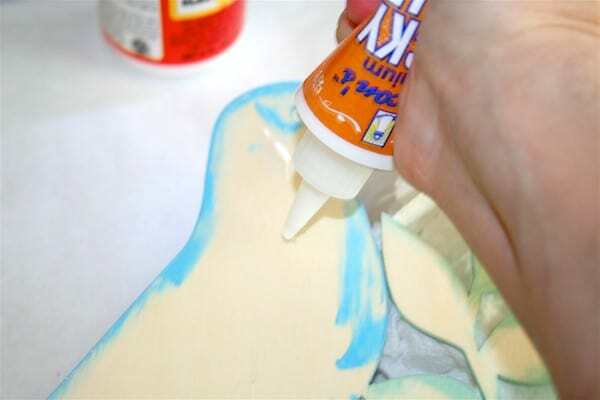 Using a brush, paint a light coat of Mod Podge onto your fabric. Allow to dry. 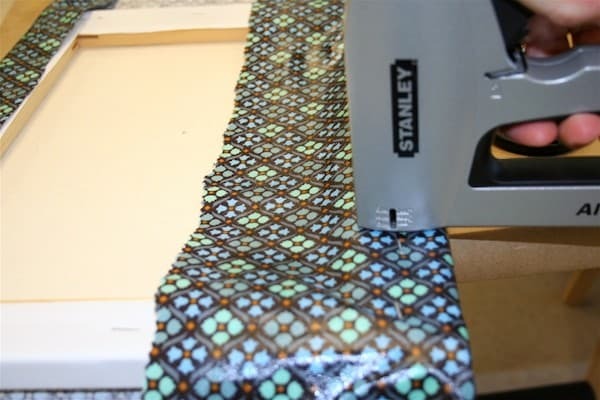 This will allow you to cut the fabric like paper without frayed edges. 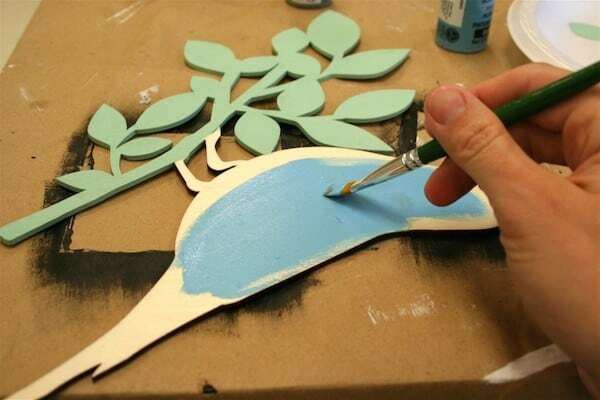 While the Mod Podge on your fabric is drying, paint your wood piece. 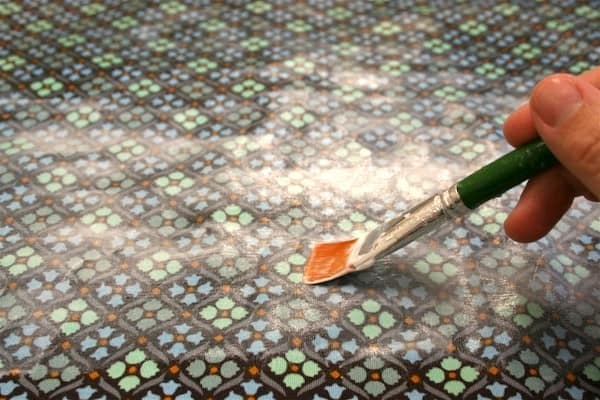 You will more than likely have to paint several coats – and don't forget the edges. Don't worry about the back. Once the leaves were done, I painted the bird blue. He can be purple if you want. Or a horse of a different color bird, yellow, orange . . . whatever suits you. Set him aside to dry. Time to decoupage the fabric to the canvas. I used a staple gun, starting on one edge and stretching the fabric across. My method was bottom, top, then sides. Corners are next. If you don't have a staple gun, use small finishing nails and a hammer. Just be careful not to tear the fabric. The corners are special. I made “flower” like corner – tucking the two parts under on each side and then folding down. I hope you can see what I did. Once I stretched the fabric over the canvas, I gave it another coat of Mod Podge for good measure. After stretching the canvas, Mr. Bird was sealed with Mod Podge. Again, do the sides but don't worry about the back. 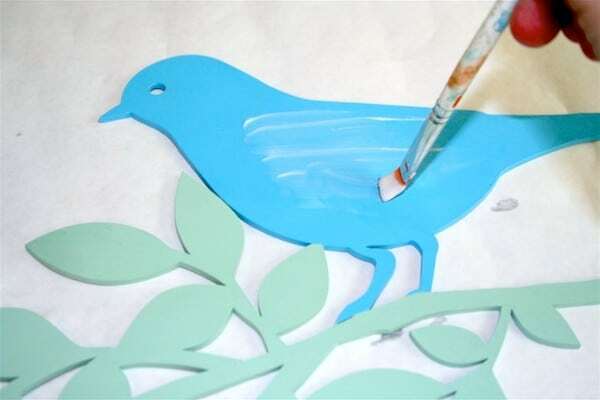 Use your glue to glue Mr. Bird down onto the center of the canvas. 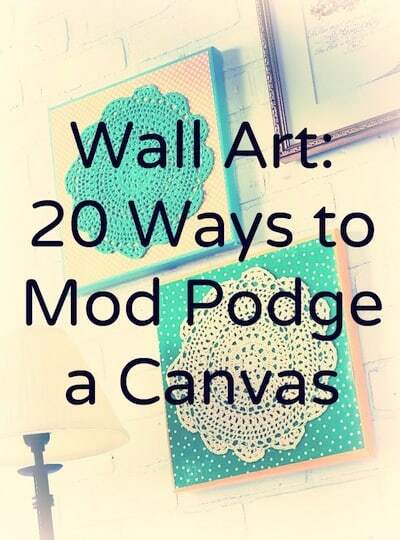 Wait for 24 hours to hang your fabric canvas art on the wall. 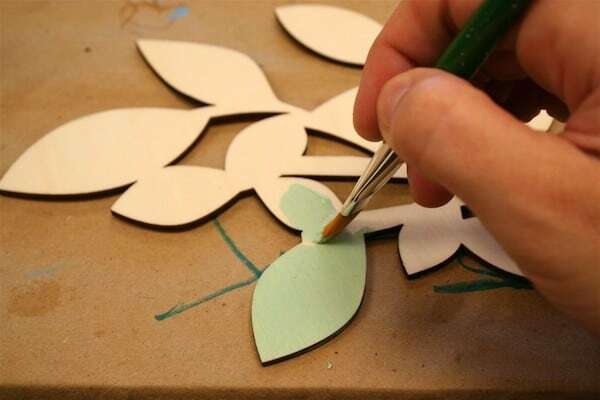 One more tip – if you don't find a wood piece that you like, consider painting something on the front of the fabric using a freezer paper stencil technique or a freehand. 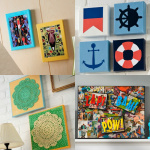 Now that you've seen this fabric canvas art project, you need more DIY canvas art ideas, right? Click on the image below to see more! I’m redoing my ‘bathroom’ (his and her sinks, mine is separate from bathroom) with polka dot material and mod podge.. I’ve done the scale, covered a box for my hair things, glasses case, about to cover a trashcan.. I just couldn’t figure out what to put on the wall… This works!! The wheels are turning in my head. I am almost sure I have a die cut file very similar to that. I could use 12×12 patterned paper and cardstock die cut. Even framed it would be cheap and awesome. I am sooo going to do this! Love it,love it, love it! Cute idea!! I love the colors. What a great idea! This turned out beautiful! I love this! Time to hit craft stores for some wood cutouts. Hi! This is a little bit off topic, but if you don’t mind me asking: where did you get your “posts” and “all comments” rss buttons? I love them! It looks like Feedburner, but I couldn’t find those on their website! SO cute, inexpensive, and fun, totally up my alley. Thanks for your comments on my craft stuff. It blows me away because you are A-MA-ZING, so totally made my day! Love your blog! OH, and I had no idea that if you mod podge the fabric it would cut that way, so awesome. Nice job! I love the look and its so easy to whip up. I have a project to share with you soon. Frugal canvas Mod Podgey goodness! What a neat project. I love the bird cutout. I, too, am always looking for new wall art to make…I’m running out of walls! 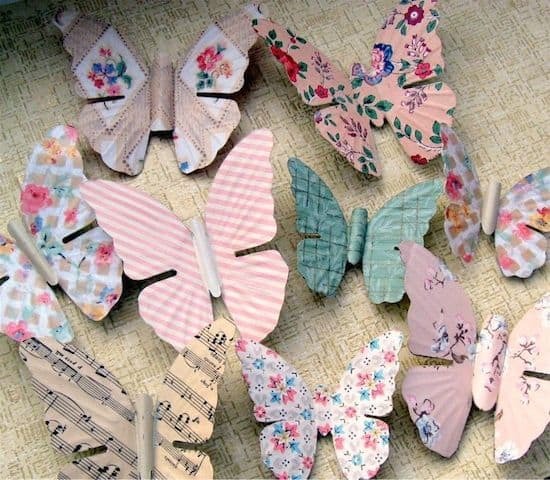 Thanks for linking up to Saturday is Crafty Day! I hope to see you back next week! Come across your blog when googling for fabric modpodge 🙂 I have never used modpodge before but been thinking of doing some modpodge on my super battered bookcase. Was a little worried how it’ll turn out, but after reading your posts. It seems doable. 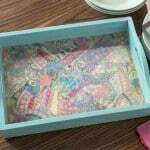 What an awesome crafty blog! 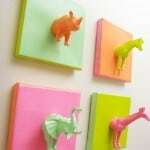 I love this wall art project! Lots of great tips too…I am going to link this site in my sidebar (if you don’t mind). this is super NICE wall art!! come on over and link up to MMM!! OHHHHH PLEASE come link this up on MIdchix!!! TRULY ADORABLE and it’s a BIRD!!!! OUR THEME!!! PLEASE!!!! Link it up in the Craft Mamas Flock!!! Wow, that’s really cool. Love it! That wood cut out is adorable! I’ll have to keep my eyes open for one of those. Love creating my own artwork. So cute!! I love it!! 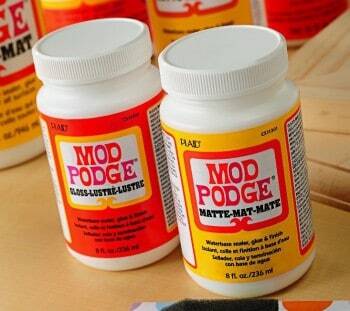 I am using Mod Podge today too!! Awesome like always Amy! Thanks for the tip on painting the fabric with Mod Podge. I would never have known to do that. There’s a modge podge blog. That is so awesome. New follower. I look forward to more great ideas! That’s pretty cool! And I love the bird, of course! I’ll be checking back to see more projects! 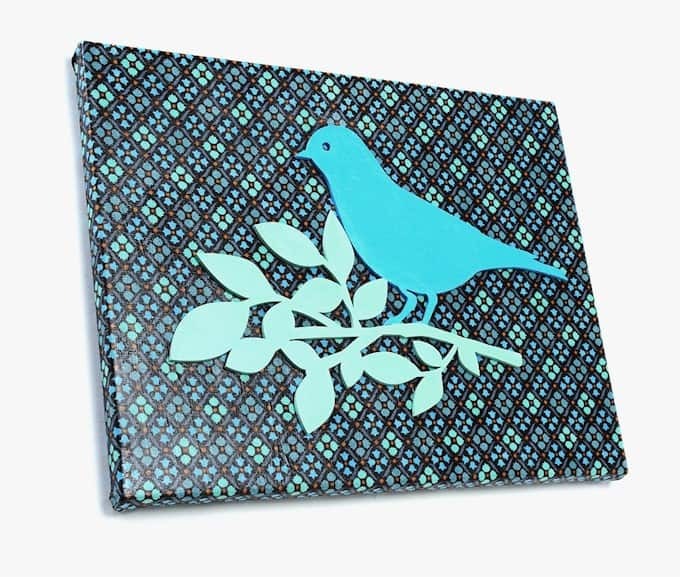 Love the dimensional bird and branch on your great graphic print. Very creative! Country Fair was one of my favorite lines! This canvas is super cute!